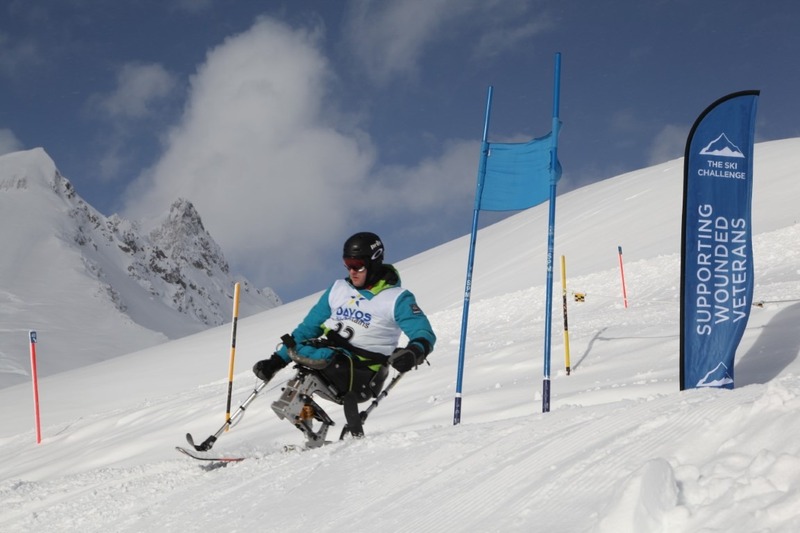 PT Ski were very pleased once again to be the organisers of the SWV Ski Challenge, a fun racing weekend raising much needed funds for the charity Supporting Wounded Veterans. We had 23 teams competing overall and this included 5 teams comprising of veterans who had been through the Charity’s programmes. We were also very pleased to welcome a veteran team from Canada. The event started on Thursday evening with a welcome drinks at the Hotel Alpina which was kindly sponsored by the Klosters Tourist Office and this was followed by dinner at the Chesa Grischuna. The competition began in earnest on the Friday with the SWV Ski Challenge marathon where teams endeavoured to ski as many km as possible in the time allotted. Their task was made ever so more difficult by high winds closing the Furka and Schiferbahn lifts. The winning score of 52.6km by “Thumb and three fingers” was good by any standards, let alone given the difficult circumstances surrounding the conditions and lift closures. On Friday evening dinner was held at the Silvretta Parkhotel where participants heard moving accounts of how some of the veterans had found their way onto the SWV programmes and how this has had a profound effect on their lives. Saturday morning saw the clouds part as teams headed up the mountain for the GS. For some this was their first ever race but all were undaunted in spite of the small jump near the top of the course. Welcome respite was to be found at the bottom where a pop up snowbar had been erected offering prosecco, beer, soft drinks and sloe gin. In the afternoon everyone was mixed up into 16 teams, with a veteran heading up each, for a knock out parallel slalom contest. It was an incredibly competitive affair with many close races, none more so than the final. It was a fantastic 2 days of racing which gave all the competitors a chance to race and mingle with the veterans, which gave them all a far greater insight as to what the charity is hoping to achieve. Needless to say, the weekend ended on a high with a gala dinner and prizegiving at the Silvretta Parkhotel. The band after dinner were awesome and had everyone dancing until the small hours of the morning. Congratulations to the Altru Team who won the GS competition, and to Thumb and three fingers who were winners of the whole competition.